PA Chairman Abbas: All of Israel is an "occupation"
All of Israel is an "occupation"
PA National Security Forces: Israeli city of Acre is "Palestine"
"We have been under occupation for 67 or 68 years (i.e., since Israel's establishment in 1948). Others would have sunk into despair and frustration. However, we are determined to reach our goal because our people stands behind us." To foreign audiences, however, Abbas implies acceptance of Israel's legitimacy, pledging that he is in favor of the two-state solution with Israelis and Palestinians living side by side in peace. "We strive for peace through the establishment of the Palestinian state, which will live in peace and stability alongside Israel." "We are experiencing difficult days, and despite all that is happening, we still hold our hand out to you, in order to establish peace and put an end to the loathing and [spilling] of blood between us. Therefore, we are trying to hold dialogue with all groups of the Israeli society." "We must hurry building peace here, and find the ideal solution, which is simple - the Palestinians and the Israelis will live in two states that will exist side by side in peace and stability, because we want our children and grandchildren to live a good, normal, and prosperous life." Yet, Palestinian Media Watch has documented numerous times that to Palestinians Abbas communicates the opposite. He uses all the communication infrastructures under his control to emphasize the message that all of Israel is "Palestine." 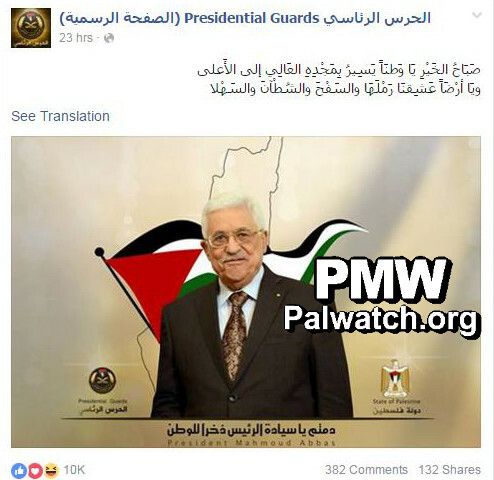 Abbas' Presidential Guards posted his photo on Facebook with the outline of the PA map of "Palestine" that includes the PA areas as well as all of Israel, and a Palestinian flag behind him. O land of beloved sand, foothills, seashores and plains." 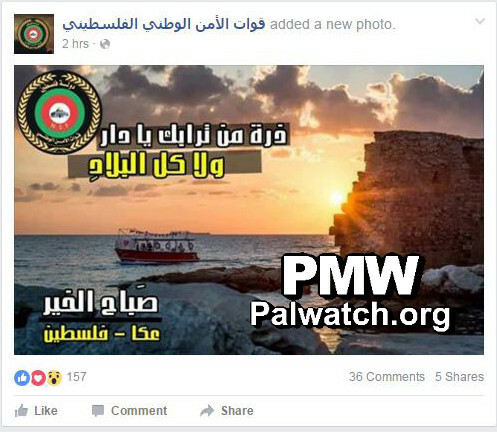 This is common practice by the PA Security Forces and numerous photos from all over Israel have appeared labelled "Palestine." "We, as Palestinians, oppose the Israeli occupation, which has been one of the main sources of terror for more than 60 years." Zayzafuna is a positive and educational magazine. It promotes family values, encourages children to read and to participate in building a modern, democratic society. However, these positive messages are directed at Palestinian society, Muslims, Christians and Druze. When it comes to portraying Israel and Jews, Zayzafuna changes its tone and includes items glorifying Jihad against Israel and praising Martyrdom-death for Allah, and the Martyrs themselves. PMW's book Deception includes a chapter on Zayzafuna. Following PMW's exposure of Hitler glorification in the February 2011 issue, UNESCO halted its funding of the magazine. View UNESCO's statement and PMW's bulletin on the December 2011 issue of the magazine. PA Chairman Mahmoud Abbas: "As we are building up man and his health, we are building an economy, agriculture, industry, and laws. All this exists, praise Allah, and is moving ahead naturally. There are many obstacles. I do not deny that countless obstacles and difficulties stand before us, but all of these are no match against our will. We have been under occupation for 67 or 68 years (i.e., since Israel’s establishment in 1948). Others would have sunk into despair and frustration. 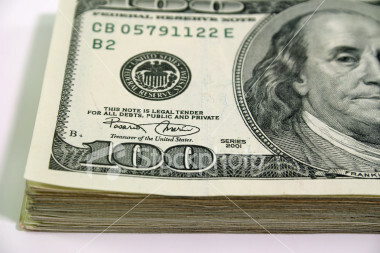 However, we are determined to reach our goal because our people stands behind us." Headline: "The president [Abbas]: Time is passing quickly, and we must establish peace and put an end to the occupation"
The president emphasized: Peace is our gift to future generations, and if we achieve peace, the peace initiatives state that the 57 Arab and Islamic countries will normalize their relations with Israel. This is an opportunity for Israeli society to live in stability with its neighbors, without walls, and without isolation.' He also said: 'A just solution to the Palestinian problem will guarantee the end of all forms of terror, and deprive the extremists who use the Palestinian cause of the excuse for spreading terror and killing. We do not want ISIS, [Jabhat] Al-Nusra, Al-Qaeda, and others to come here, and therefore we must establish peace and put an end to the occupation'." Headline: "The National Council demands the determination of a definition of terror and its reasons"
Al-Ahmad emphasized that we, as Palestinians, oppose the Israeli occupation, which has been one of the main sources of terror for more than 60 years, and see how some of the international forces still hold double standards regarding global issues. Al-Ahmad demanded that the world apply international law to the Israeli occupation, which is one of the sources of terror in the Middle East, and wondered why some of the international powers insist on continuing to provide many Arab countries with reasons for anarchy and destruction, and to support the civil wars taking place within them."